Culture, industry and community converge to make Boston’s Seaport district a dynamic and vibrant area that is quickly emerging as one of the most exciting neighborhoods in the country. Combining the best of historic and modern Boston, the Seaport is becoming a destination for culture, arts, fashion, dining and entertainment, expanding Boston’s position as one of the top cities in the world. The Seaport’s art scene continues to grow, this time with an internationally renowned public installation. WS Development is transforming Seaport Common into a lively interactive art experience, Seaport x Impulse. Seaport x Impulse is an internationally renowned public art installation, made up of 15 LED see-saws that produce various intensities of light and sound sequences when activated by users. LED light is reported to increase well-being, mood and overall health during cold winter months. The project is on view at Seaport Common from February 16th through April 8th, 2018. The installation is free and open to the public. 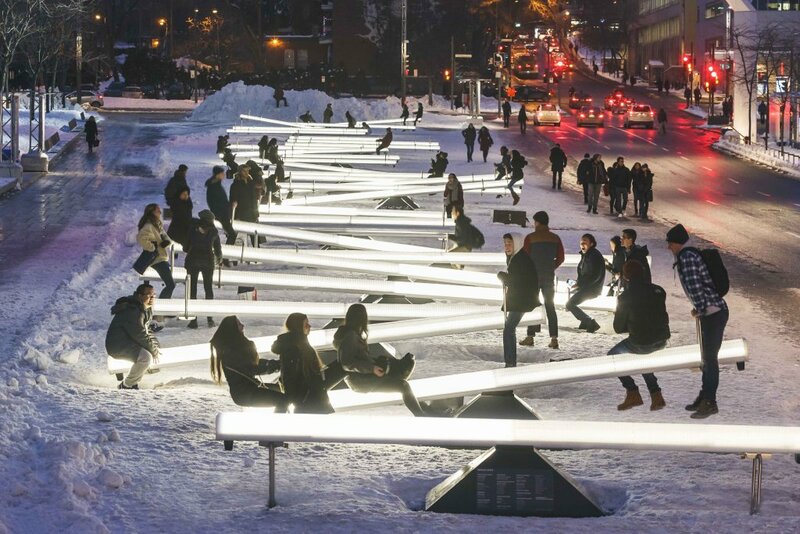 This is only the latest stop for Impulse seesaws, which have been installed in cities around the world, including London, Brussels, Chicago, and Montréal. The project comes courtesy of WS Development based in Chestnut Hill, a major new property developer of Boston’s Seaport neighborhood. With more than 20 million square feet of existing space and an additional five million under development, it is one of the largest privately-owned real estate firms in the country. WS helped develop the retail space within the Benjamin Residences & VIA, and both are now 70% occupied. This is the largest mixed-use project in the city of Boston in over 30 years, totaling 1.5 million square feet. In business since 1990, WS is a vertically-integrated company that develops, owns, operates, and leases over 90 properties, including urban buildings, community centers, and mixed-use developments. Its goal is to be a contributing member of each community it serves. WS takes pride in its commitment to its roots, reflected by its many properties in and around New England.